collective set of mind’s eyes. After a three-year touring hiatus, Dunedin’s least fashionable band are strapping on the jandals and getting in on the summer tour action. With four dates on the South Island’s untameable west coast followed by a triumphant homecoming and a few more to be announced down south, it promises to be a magical romp. But wait - there’s a cherry on this hootenanny-cake: All shows are free to the public. 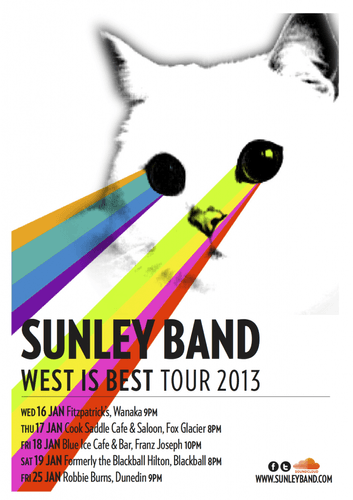 Follow Sunley Band on Facebook or Twitter for updates and insights as well as to check out some home-cooked alt-country-psychedelic soul music.